A wheat allergy is most common in children and is often outgrown by adulthood, but can be outgrown as early as the age of three. Approximately 65% of children with a wheat allergy will outgrow it by the time they are twelve. Many consider a wheat allergy to be one of the most challenging of the top eight food allergens because so many food products in the United States include wheat. As much as 75% of all grain products are made from wheat flour. How do I know if a food has wheat in it? If I have an allergy to wheat, are there any other foods I need to be careful and avoid? It is important to read all ingredient labels carefully as there are many products that surprisingly contain wheat including some brands of ice cream, marinara sauce, potato chips, rice cakes, turkey patties, and hot dogs. It is also important to be wary of products that could be cross contaminated with wheat, or have “made on shared equipment with wheat” on the label. Wheat can also be found in some non-food products including play dough and cosmetic and bath products. It is important to check the manufacturer’s website or contact the company, since allergy labeling is not required by law on nonfood items. If I have a wheat allergy, what grains can I safely eat? Be sure to talk to your health care provider about which grains are safe for you to eat. What about baking? Are there any wheat substitutes? Is a wheat allergy the same as having Celiac disease or gluten intolerance? No. 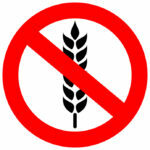 It is easy to confuse Celiac disease with a wheat allergy but they are not the same thing. Celiac disease affects the small intestine and is caused by an autoimmune reaction to gluten, the protein found in wheat. It is not an allergic reaction. To learn more about Celiac disease and gluten intolerance, please be sure to check out our Gluten Guide. How can I tell if I have outgrown my allergy to wheat? Up to 65% of children who have an allergy to wheat will outgrow their allergy by the age of twelve. Be sure to talk with your health care provider(s) about the status of your food allergy to learn if there are signs that you might be outgrowing it. Your HCP will be able to check skin and blood tests to detect whether or not the allergy is resolving.